Rick Hopkins is senior product manager-welding and fabrication for Weiler Abrasives Group, Cresco, PA, 570/595-7495, www.weilercorp.com. Ron McCarthy is director of marketing for Oliver H. Van Horn Co., New Orleans, LA, 800/800-7070, www.ohvanhorn.com. 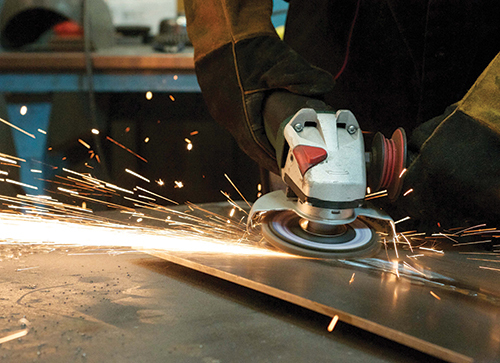 When working with thinner materials, flap discs are often a good choice. They provide reliable grinding action, while also allowing for more delicate blending and finishing work. Flap discs, when used for applications with thinner materials, can reduce the risk of removing too much material while reducing process costs and time. However, in order to select the best flap disc for the job, features, performance characteristics and job requirements must be considered. When working with thinner materials, flap discs provide reliable grinding action, while also allowing for delicate blending and finishing work because of their soft feel. The flap discs feature coated abrasives that adhere grains—the same grain types found in bonded abrasive—to a backing cloth, typically a cotton, polyester or blended material. This abrasive cloth is then cut into smaller flaps and layered radially to form the flap disc. How a flap disc performs is largely related to the abrasive material used and its grit size. Three primary cutting grains used on flap discs include aluminum oxide, zirconia alumina and ceramic alumina. The flaps wear away as the grains deplete, which exposes fresh and sharp grains below. When used properly, a flap disc essentially can be used until the cloth is nearly worn down to the back plate. To maximize effectiveness and longevity of a flap disc, use the proper pressure at the proper angle. In general, flap discs are designed for use on right-angle grinders at angles from 5 to 35 deg. A Type 27 flap disc is best for finishing and applications requiring lower grinding angles ranging from 5 to 15 deg. A Type 29 flap disc is best for more aggressive, higher-angle grinding, between 15 and 35 deg. Before selecting your disc, consider which type will be best for helping achieve your surface-finish requirements, desired aesthetics, and time, productivity and efficiency requirements, while minimizing labor and consumable costs. Generally speaking, to ensure the best possible finish, choose the highest grit possible that still gets the job done. In addition to standard-density flap discs, high-density (jumbo) flap discs have more cloth on them, making them thicker, softer and longer-lasting. 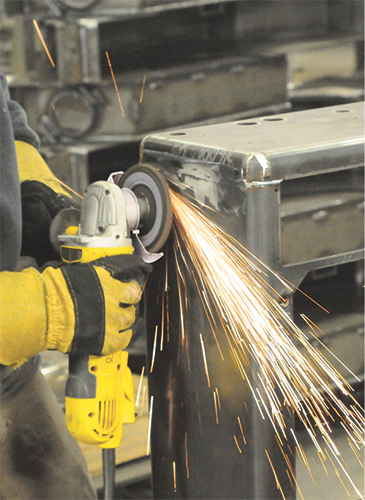 High-density flap discs are the best choice for grinding on curved or irregular surfaces. Flap discs are made in different sizes, too, ranging from 2 to 7 in. A 2-in. disc can essentially replace a blending disc, and gives an operator as much as 15 times the use. Reducing the number of product changeovers can have an immediate and dramatic effect, and significantly lower the overall cost of use. Some flap discs feature a trimmable backing plate that can be removed progressively to establish the desired flap overhang. This feature provides an operator with a more versatile product for multiple jobs, and can extend the product life. Every flap-disc manufacturer has recommendations for trimming. A common one is a maximum trim of 3⁄8 in. from the edge of the original backing plate. Remember that not all plastic-backed flap discs are trimmable. Those that are use composite or glass-filled nylon back plates—not plastic—that allow the edges to be trimmed without shattering. Before trimming any flap disc, the disc must be marked or rated as trimmable. Operators also need to read and understand the manufacturer’s recommendations. Select a sharp piece of scrap material. Ramp the flap disc up to speed. Slowly lift the flap disc until the flap’s top (or overhang) contacts the scrap. Push directly into the corner of the metal with consistent, controlled pressure. The process may take some practice to perfect, but in the long run it can save time and money. Aluminum oxide is a common choice when a consistent, low-cost product is needed, but the most common flap disc used today is zirconia alumina. This type of flap disc provides a blend of zirconia-alumina and aluminum-oxide grains as well as the most versatility. Although it is slightly more expensive upfront than an aluminum-oxide flap disc, it is more heat-resistant and more durable, and it maintains its sharpness longer. Another choice is ceramic alumina. The grains on these flap discs micro-fracture to enable a continuous supply of the sharpest edges, and they are more resistant to heat. Ceramic-alumina flap discs are the most expensive option, but they last the longest of the three types. In the end, the goal is to find a flap disc that accomplishes the application’s requirements within a desired timeframe and budget. To maximize a flap disc’s effectiveness, it’s important to use the proper pressure at the proper angle. Putting too much pressure on a flap disc when it does not work rapidly enough can cause premature wear or lead to gouging, undercutting or heat buildup, and discoloration. If you find yourself needing to push harder to have a disc perform, consider a coarser grain. Using too much pressure also can undercut, gouge or damage the workpiece. Premium cutting grains such as ceramic alumina require maximum tool speed. Excessive pressure can cause the grinder to bog down, actually reducing the grain’s cut rate. Glazing or dulling of the grain also can occur, limiting the disc’s ability to cut. Once this happens, the disc must be discarded—even if it’s only partially used. When choosing a flap disc, find one that accomplishes the application’s requirements within a desired timeframe and budget. Similarly, grinding at too steep of an angle causes operators to work much harder because they’re not using the full width of the cloth. Grinding steep also places increased pressure and stress on the flap overhang, which can reduce product life. When finishing thin-weld material in particular, do not remove too much of the metal, as this creates a weak point. This is another good reason to select the least aggressive disc that will do the job, especially when tighter tolerances are required. Undercutting or gouging the thin material could ultimately ruin the workpiece. In applications where these issues are real concerns, it is usually best to use a higher grit —such as 60 or 80—rather than a 36- or 40-grit disc. Flap discs are designed to be used to the point where you can see glue through the flap, so don’t try to judge whether a disc has been fully used based on flap wear. When used properly, a flap disc will continue to cut until this glue is visible. This insight, when shared with all operators, can result in significant cost savings.